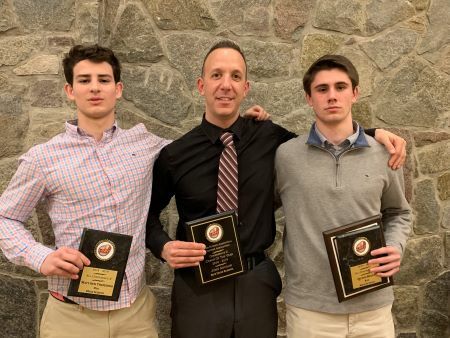 The Lower Hudson Basketball Coaches Association gave out their post-season awards Tuesday night, and Rye High Head Coach John Aguilar was named Class A Coach of the Year for guiding his Garnets to the Final Four. He’s flanked by All-Conference junior guard Matthew Tepedino (left) and All-Section choice, senior Quinn Kelly. Congratulations to our all-stars!